Front sides of the Wee Stripe Speed Tight IV, left, and Giant Herringbone Speed Tight II on the right. I ordered the Wee Stripe Speed Tight IVs from last Tuesday's upload and finally decided to try them on today. I'm glad I did because I was prepared to just put them in my drawer and keep them without a try on. I assumed the material was the same as in the Wee Stripe Pace Rival Crops I bought a few weeks ago (it is) and they were just as nice as my beloved Giant Herringbone Speed Tight IIs. The fit is very similar but I am not a fan of the noticeable dark stitching. My biggest pet peeve is the seam that starts at the bottom of the thigh pocket in the front and cuts across the back of the thigh. I think it visually chops my leg too much. I also don't love the gathers at the bottom of the leg. The length is a bit different, too. Speed Tight IIs have a 30" inseam and the IVs are 28.5". Note the less discrete back zipper pocket and that the location of the logo has moved. For reference, Speed Tight IIIs have the horizontal seam and the gathered leg but the logo is on the leg, the inseam is 30", and the back pocket also has the discrete zipper. Gathers seam in the calf area. Speed Tight IV back pocket. 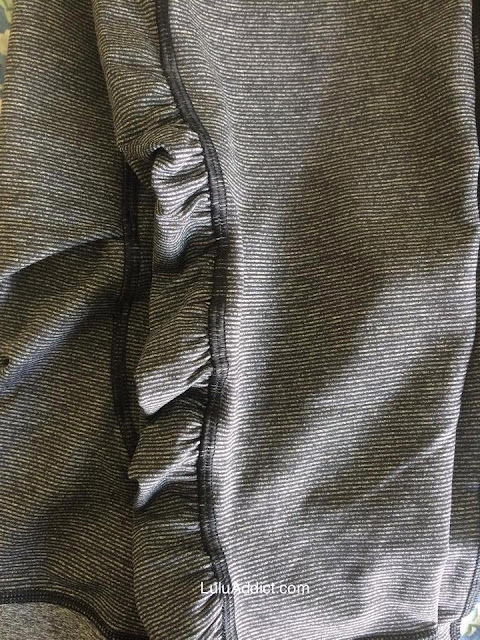 Speed Tight II zipper pocket. 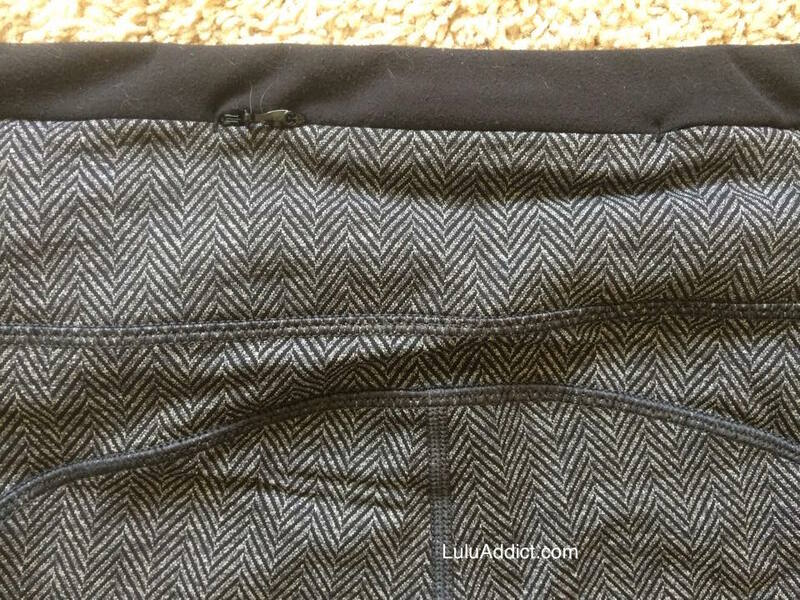 Comparison of the back zipper pocket. seriously, they are cutting corners more and more.... 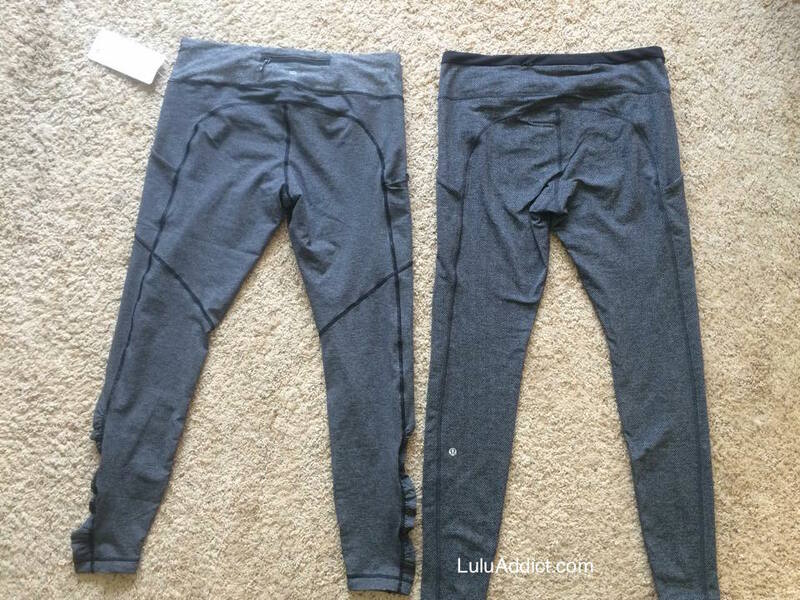 I second what others have said before, lulu products look cheaper and lower quality lately. I was ready to buy the speed tights (I don't have any) but this post convinced me not to (unless they are on crazy sale on wmtm). LLA seam bugs me as well. I love my old Speed Tights (I, II and III). Will pass version IV. Nice - I have the wee stripe pace rivals and love them. I went to a store yesterday morning hoping to try the speeds on, but they didn't have them. I was curious about sizing though, so I tried on the black speed IVs. I agree with you about the seam that runs across the back of the hamstring - not my favorite placement, and I did feel it right away when I put on the tights. Apart from that, though, I actually much prefer the black speed IVs to my other speed II tights. The material feels much nicer (less polyestery, if you know what I mean) and is more matte. I actually fit a size 4 in these, whereas my speed IIs are a size 6. I also prefer the shorter length - my speed IIs are way too long on me (I'm 5'6") and these were just about perfect with a few inches of wiggle room for taller gals. @ aon 5:58 pm - the Speed Tight III has the seam across the back of the thigh, too. I agree, the seaming on the rear of the Wee Stripe Pace Rivals is way more flattering than the Speed Tights. @Sophie - I swear I could feel the seam across the back of my leg, too. Thanks for this, LLA!! 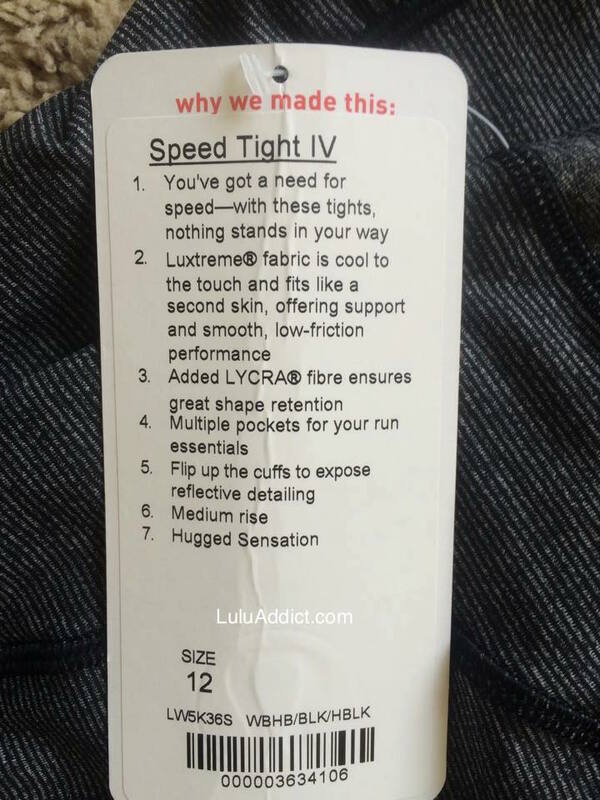 I love speed tights, and I've been wondering what the difference between them was before I started sniffing EBay. I have the IVs in wee, gator and black and I like them a lot. The seam isn't a deal-breaker for me, but I don't love it. And I'm 5'10", so I'm not too happy that the new version is a liittle shorter (Good to know!). I need every bit I can get! I'm hoping tjhicket versions will be coming out for winter -- I'm lusttibg for that herringbone!! Sooo glad to see this LLA, this is what we count on you for! Shocking and honestly sickening to see Lulu cutting corners yet AGAIN and skimping out. The side ruching looks flimsy and I could see them pulling out when doing a try on. No thanks. I'll stick with my old Speeds that are slightly longer, but I don't mind the extra length at all in the Winter because it keeps my ankles warm. I don't think they're cutting corners on these pants other than maybe the change in length, but lululemon may have gotten feedback about the length of Speed Tights. The Wee Stripe material is nicely thick, so no cost cutting there. The seam across the back is so they can put in a mesh lower leg, like on the Gator Speed Tights. I like my Speed Tights solid luxtreme but others probably like a mesh option. I swear the first version of Speed Tights used to have the ruching along the bottom, too, but I may be misremembering. There is a lot of cost cutting/wonky fits going on in general. Purchasing off WMTM used to be a pretty safe bet for me, but I'm not allowing myself to do it anymore. I just got some WMTM cotton WUCs in and the material is nothing like the cotton WUPs I have (and my 2 other practice cotton crops). I love the cotton pants and thought this was a slam dunk! Nope--thin, stiff, and scratchy. I could request a return exception, but I don't feel like dealing with them. Really disillusioned. Lately I have finally begun buying from other brands and will likely continue to do so more and more. It just makes me too sad to spend my money on clothes that aren't worth it. the first thing I noticed in the photo at the top was the seam in the middle of the back of the leg.It really takes away from the design. 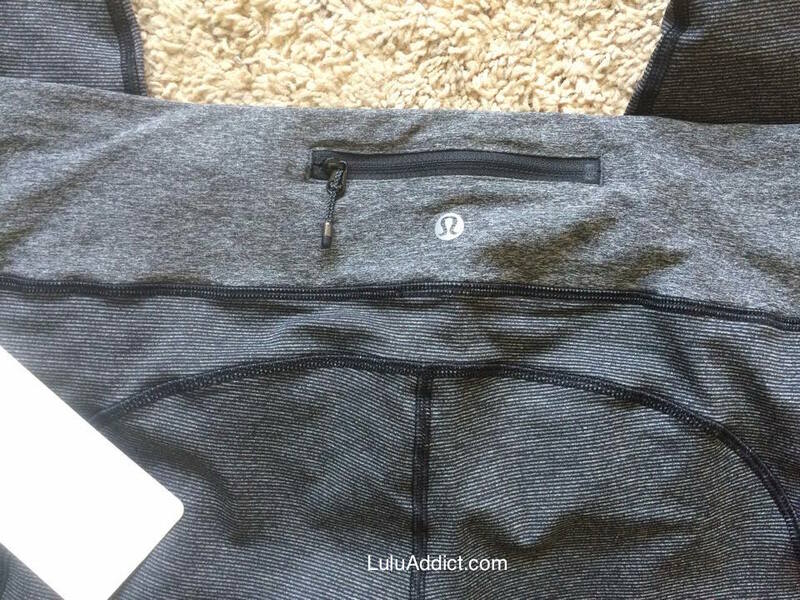 I don't think that LULU is cutting corners, they just keep re inventing designs that are working just fine, to make it look like they are churning out new product. I like my old speed tights and would buy more if it was still the old design. They did have the side ruching, I have an old pair with them and they removed them for a year or two to see if we wouldn't notice. I hear what you are saying, but the obvious zipper that isn't disguised, and lots of other missing extra details that perhaps take the seamstresses another half hour to sew in, those are the little things that us old Lulu lovers like. Ruffles on pullovers for example. It's just another ongoing frustration with this company is all I'm saying... To me, the new Speeds look weird. That was the whole point of the Speeds. I have the Pace Rival in the wee stripe and I don't have any complaints, but why have 2 of the same basic product? But yet, come Winter time, we'll barely see any full length running tights and tons of these crops! I absolutely loved the Speed Tight IV when I tried it on a week or two ago (the plain black one). 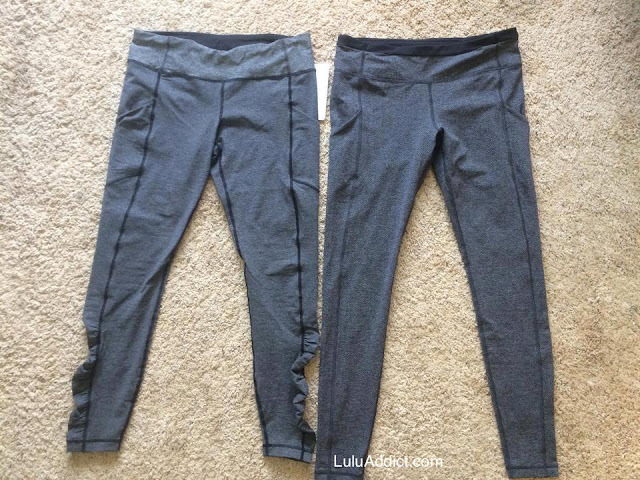 They felt sturdier than any other tight I've tried from Lulu and I loved the fullux back because they're opaque plus give an extra squeeze, without having that awful fullux feel over my entire legs. I personally loved the ruching - I got the Trail Blazer Crops a few weeks ago and fell in love with the (same) ruching on those. I was really worried that, being 5'5", they'd be super long as all the reviews complain about that, but they honestly fit me perfectly with less than an inch of extra material (which pretty much disappeared when I folded up the reflective strip). I'm holding out for the tech fleece version, and I'm hoping they're similar to these. Thanks for the great comparison! I tried my IVs last night and like them enough to keep. The wee stripe Luxtreme is so nice. I don't know why they keep updating the style though. My favorite version is the original. I'm glad they at least brought the ruching back. It is a nice touch. LLA have you seen this video yet? It's hilarious! Speed Tight (original) has the ruching. I don't mind the seam when the mesh is there, but it if the tight is a solid w/ no mesh, the back seam looks awkward and unflattering to me for some reason. I have a few pairs of older speed tights that have the gathering at the bottom. I actually really like it because it makes them a bit different than a plan straight leg. Yep old ones had touching I have the cozy in purple and plum and wafs in grey,plum and blue. I don't mind the changes not sure about the one seam but I wear mine a ton even under scrubs for warmth. I do mind the price being higher. I hope they come out with tech fleece speeds this winter, those are really warm when it is freezing outside. @KAS - I would love a Sapphire CRB.